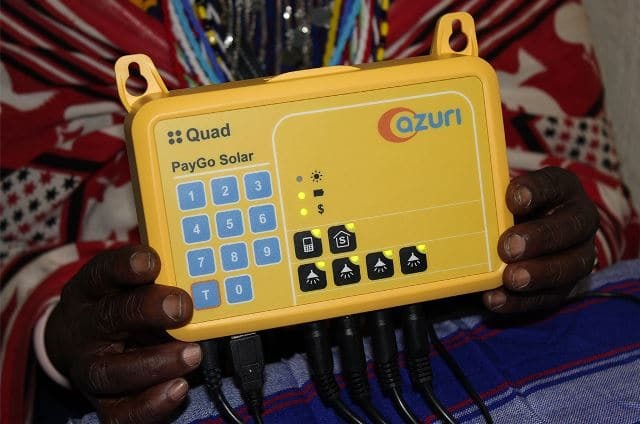 Azuri Technologies, a solar energy provider, is targeting to connect more than 150,000 Kenyan households with off-grid energy in the next three years. General Manager East Africa Snehar Shah says the firm is ready to expand its reach with a Ksh2 billion commercial debt financing it received early this year. Of the Ksh2 billion, about ksh400 million will be deployed in Kenya. “The PayGo sector is growing rapidly and its continued expansion requires access to substantial levels of capital. The debt financing will go a long way in increasing the reach, a significant number of people are yet be connected to the national grid,” he noted. The company says that it has so far connected about 150,000 homes with PayGo solar systems in the last five years which also includes a solar-powered 24-inch satellite-TV. The Ksh2 billion debt financing was through crowdsourcing as well as Ksh1 billion European Commission fund. Headquartered in Cambridge, United Kingdom, with staff based in Kenya, Tanzania, Uganda, Zambia, and Nigeria, Azuri is leveraging solar and mobile technology to allow users in 12 different countries access renewable, distributed power on a pay-as-you-go basis. According to Renewables 2018 Global Status Report, sales of off-grid solar systems in Kenya, the largest market in Sub-Saharan Africa, decreased 25 per cent in 2017 compared to 2016. This followed years of growth from 2009-2016, which saw about nine million households access off-grid electricity connections. Globally, in 2017, an estimated 25.8 million off-grid solar systems were sold, a 14 percent decrease from sales reported in 2016. The report further notes that off-grid solar-based systems have increased access to electricity in most rural areas in East Africa with 51 percent (9 million households) of the off-grid population in Kenya is served by distributed renewables for energy access systems, which are mostly solar. The mini-grid solar based installation targeting off-grid communities, according to the report, got increased attention from investors and governments.